Greetings from me, Chopper. We’re over the moon on being a Green America Certified Business! Our goal is to make the world a better place while providing eco-friendly fun for our furry friends. Every brand we carry is thoroughly examined to ensure they align with our values. We bark about each one because they meet our criteria. We love a company who works to help the environment. Our passion for picking up pollution and making nature more enjoyable is an important part of who we are at Chopper & Otis. Planet Dog Recycle toys reuse leftover scraps to make new toys. Returned and defective toys are given a second chance as new playthings, not tossed out due to imperfections. We also consider a company’s green business practices. A green business tries to minimize negative environmental impact. Many green businesses take on special projects to benefit local and global communities. P.L.A.Y. is a stellar example of living green. 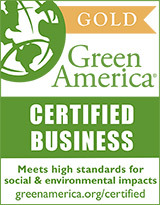 They are Green Business Certified for their internal and external practices. Environmentally-responsible sourcing, manufacturing and administration all have an impact on the world around us. Additionally, they’ve kept over a million plastic bottles out of landfills to date because they use the plastic for their toy fluff. We love things that are sustainable. Our brands are socially responsible and environmentally friendly. They give belly rubs to communities in their own unique ways, much like we share the love with different shelters and rescues. Lastly, we consider the composition of every toy. Our toys have to be safe for dog hands (meaning mouths) and good for the environment. Many inexpensive and popular toys are toxic for pets, but they’re so readily available that pet parents don’t always investigate their components. We research our brands so much that you know we’ve got your buddy’s back. Beco Pets is made of good stuff. Recycled bottles are used to stuff the soft toys. Rice husks and natural rubber give a soft but durable texture to the tough toys. All components are safe for dog play. We love that they make donations to their community, environmental and animal causes. If you ever have questions about one of our toys, please feel free to contact us. We want you to be proud of your purchases for your best friend.